The explosion of the shot pierced the early morning quiet of the forest as I was about to prepare myself a bowl of baked oatmeal. “Already?” I thought to myself. Looking through the window, I saw David sitting quietly in his chair beside his truck. It was a cold and damp morning, so I grabbed my plaid wool coat, (the one I’ve been having since my teens), and put it on over my dirty pink robe. I then pulled on my green flowered Boggs to complete the look. Hoping I wouldn’t run into the new neighbors in this condition, I went outside to see what had happened. David sat still as I approached and I began to wonder if it was his rifle shot that I had heard. Had he shot at a deer, missed it, or perhaps only wounded it? Walking towards my husband, I noticed a healthy-looking buck staring at me from about 35 feet away. Then, David pointed to the trail below. A buck lay on the trail, his body motionless. I turned my gaze away from the trail to look back at the buck on the road, but he was gone. My mind wondered whether he knew what had just happened, whether or not he cared, or whether it even mattered. He had lived to see another day, at least in our neck of the woods. The bucks had remained elusive since hunting season opened. It wasn’t until a couple of days prior to Buck’s demise that the girls saw two of them in the land of dog houses and another one in the woods near the road. It was as if they knew that someone from our home was stalking them. I’m still getting used to hunting and have mixed feelings about it, as I did with Jake. At first I felt sad when I saw Buck’s lifeless body lying on the ground knowing that we had snuffed out his young life. I felt guilty, I think, because the deer visit our yard and I enjoy watching them from my kitchen window. Turning around and killing one during hunting season somehow feels like a betrayal of their trust. Buck was still when we reached him on the trail, and his eyes were glazing over. I stooped down and touched his neck and fur which was much softer than I had expected. He was a beautiful animal. Thinking of Temple Grandin, that Buck was no longer in that body lying on the ground, I thanked him for his life and stood up. It was time for the field dressing and Mallory and Eileen took turns dragging Buck down the trail to a better spot in the woods where this would be done. Buck lay on his back as David took his knife and split him open. Organs bulged out of Buck’s belly leaving a pool of bright red blood in his rib cage. The stench of blood and guts permeated our nostrils and as I watched this gutting of Buck, I couldn’t help but think of how perfectly designed we creatures are. Like well oiled machines, we function with ease, rarely concerned with what makes us tick. Our organs are the orchestra for which our brain is the maestro. It is truly remarkable. A shift in the wind and colder temperatures; the weather began deteriorating. Some of us went inside to put on warmer clothing. 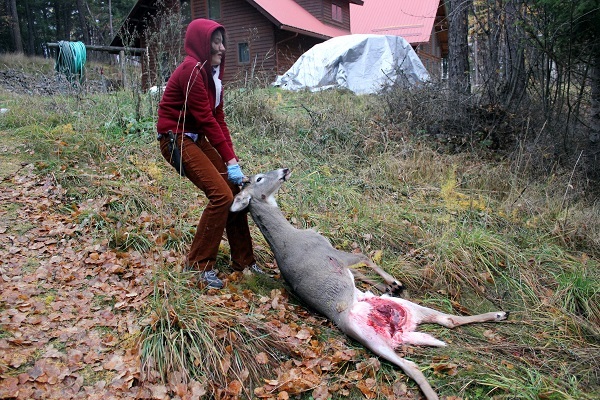 Eileen dragged Buck up to the lawn where his eviscerated body was hung for skinning and butchering. David’s homemade gambrel (a device for hanging and butchering carcasses) was made out of his Presto lift, some rope, and an old broomstick. 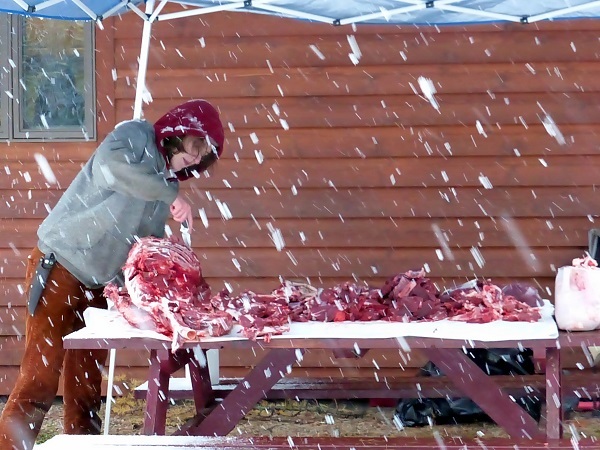 It was a fine set-up and our girls did an excellent job of butchering the carcass. Snow began falling more heavily as the day wore on. 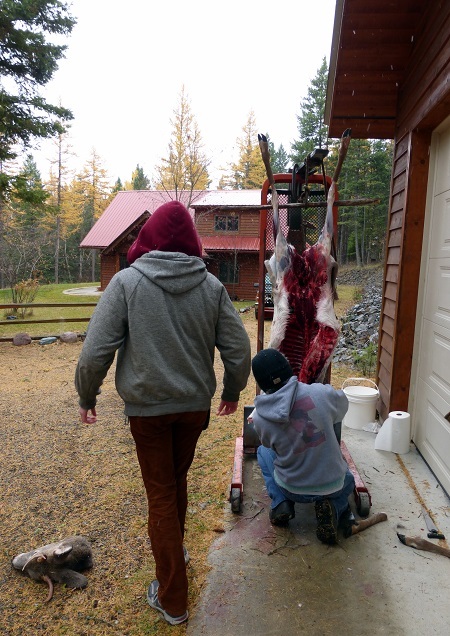 A canopy over an outdoor table made butchering the venison into steaks and roasts a little easier, and more bearable in the inclement weather. Buck’s hide was saved for tanning, tallow was retained for making soap and candles, and the freezer was stocked with fresh venison. Nothing went to waste and Buck’s legacy lives on. Not only will he nourish my family and Wessah, but also the wild critters of the forest who feast on his remains. Please visit us on facebook to see the album, “Buck Feeds His Neighbors”. 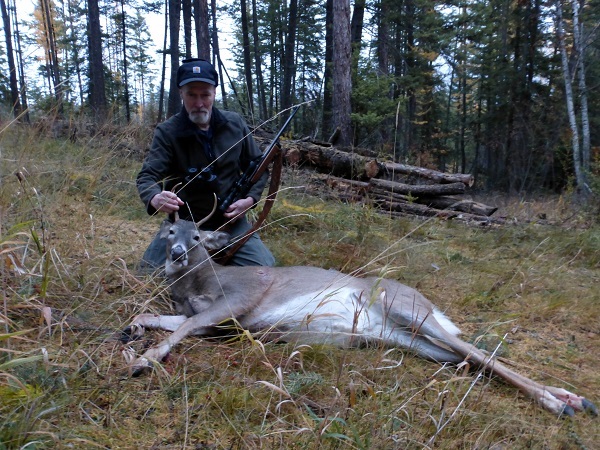 Glacier Country, Outdoor Adventure, Wildlife autumn, deer, hunting, Life's an Adventure, Montana, outdoor, outdoor adventure, outdoors, RMKK, western Montana, wildlife. permalink. Buck’s Carcass Claimed by a Fox! Absolutely rivetting. I wish i were ther sis.